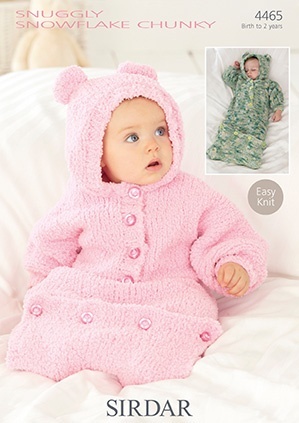 Gorgeous Baby All in One and Sleeping Bag to knit in Sirdar Snuggly Snowflake Chunky. Balls required Snuggly Snowflake Chunky - Shade 644 7-9 x 25g balls. Sleeping Bag Size 0-6 mths	6-12 mths,	1-2 yrs.